Its only two days to go one of the biggest events on the local arts calender, Portsmouth Uni Graduation Arts show. The preview evening is Friday June 3 from 5-8pm. The show will then be open to the public from Monday to Saturday from the 6th to the 11th of June, 10am-4pm daily. Admission is free, and everyone is welcome. The venue is the Eldon Building, Winston Churchill Avenue, Portsmouth PO1 2DJ. It felt right to interview a wonderful young lady who will be graduating and who has invited me to see her work, Katie Lewis. 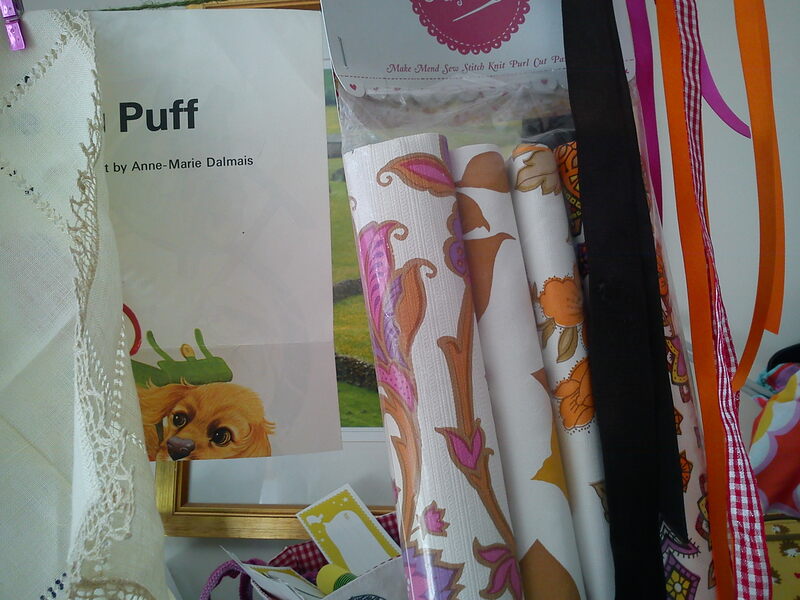 How did you discover a love for textiles? I guess it was during college when I did a national diploma in art and design that I discovered a love for fabric and textiles. I have always been more hands on with the materials I use and wanted to explore a more tactile surface to apply the text I write. I feel there is somthing romantic about fabric and the process of manipulating it. In terms of changing perception of what is expected. Tell us about the pieces for your degree show? I produced a textile installation that explores ideas surrounding form, scale, print, stitch and text. I wanted to challenge the perceived perception of sculpture and text in art. I feel text, words and statements encourage interaction because our human conditioning draws our curiosity in and I find this extremely appealing and enticing. The text for this specific piece was a series of direct anonymous one liners concerning culture, experiences, love, life, etc. The materials I used I feel have a delicately soft appeal that sympathetically and emotionally contrasts with the explicit text which supports and harmonizes with my individual thoughts, feelings and emotions. 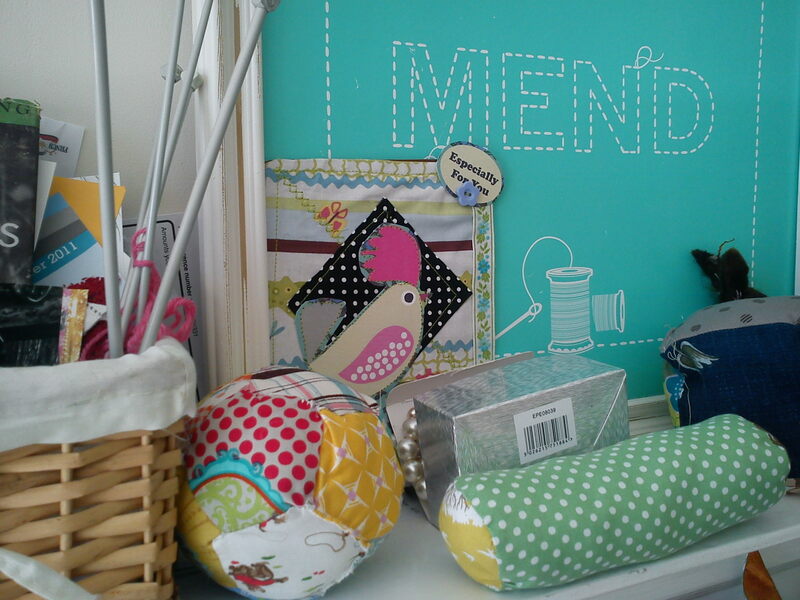 What new textile skills would you like to learn? I feel I have gone as far as I can with exploring textiles within art and would like to learn some craft techniques such as, crouching, weave and felting. I want to explore how these techniques could be applied to textile art and try to build a relationship between the notion of craft and art. What do you see yourself doing after you have graduated? I would like to continue exploring textiles in terms of craft techniques and further my knowledge and understanding of the discipline. I want to continue my work as a freelance textile artist however I have a desire to teach and broaden the expectations of art within education. I would like to get involved with art workshops which I have done through Pompey Stars and very much enjoyed. What artists/makers do you admire? 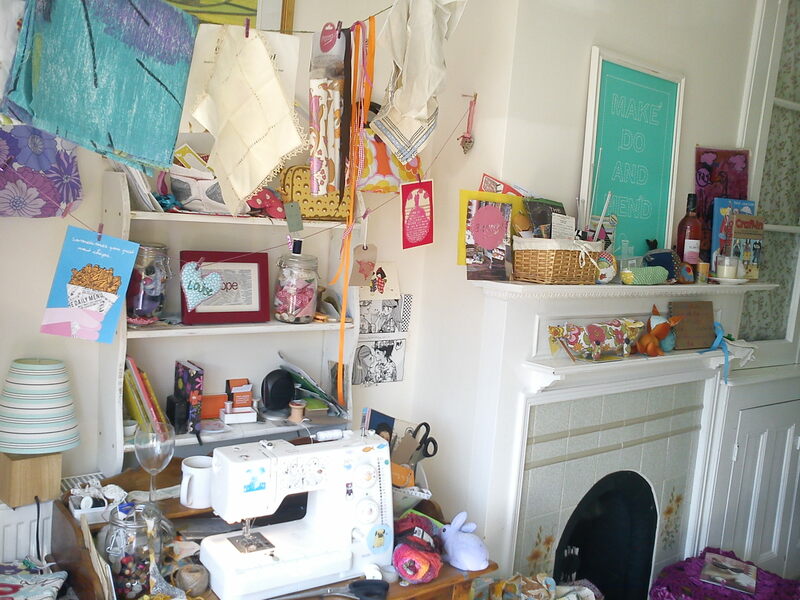 Throughout my education I have become aware of many artists, designers and makers. All of which I have found extremely inspirational from various disciplines such as, fashion, fine art, textiles, text, etc. In particular I have always been fascinated with the work of Tracey Emin I feel her text speaks volumes in such a provocative manner that cannot be ignored similar to Jenny Holzer, who was my dissertation subject – ‘Jenny Holzer: Writer or Artist?’ because of her direct anonymous one liners known as ‘Truisms’ captured the essence I wish to provoke and which I based my writing for my degree piece around. I feel I am very much inspired by strong, powerful and direct women. Will you miss Portsmouth and what do you think of the creative scene in the city? Yes I will miss Portsmouth very much. It has been my second home for 3 years and I have loved exploring the many different areas of the city. I feel I will always have a connection with the place and will come back as offen as I can. I have always wanted, since a small child, to live by the sea and it has been very magical and inspirational. I think Portsmouth has a quite diverse creative scene within in all disciplines of the arts. There are a lot of events and things happening at the moment that have really launched the creativity that once wasn’t apparent to me. Only in the last few months I have realised potential of it all and how I will sincerely miss not being part of it. Thanks Katie, I cant wait to go on Friday and I really wish you all the best for your future career! Chunky or delicate, knitted or knit inspired home accessories will be everywhere this autumn. It took the high street long enough to catch on to the whole ‘shabby chic twee country look’. Im kind of sick of seeing pastel coloured spotty cushions and instead just adore bold folky prints and craft inspired designs. If your a maker you know you can attempt things like the basket above from Ferm Living if not theres plenty of bits alredy on the net. 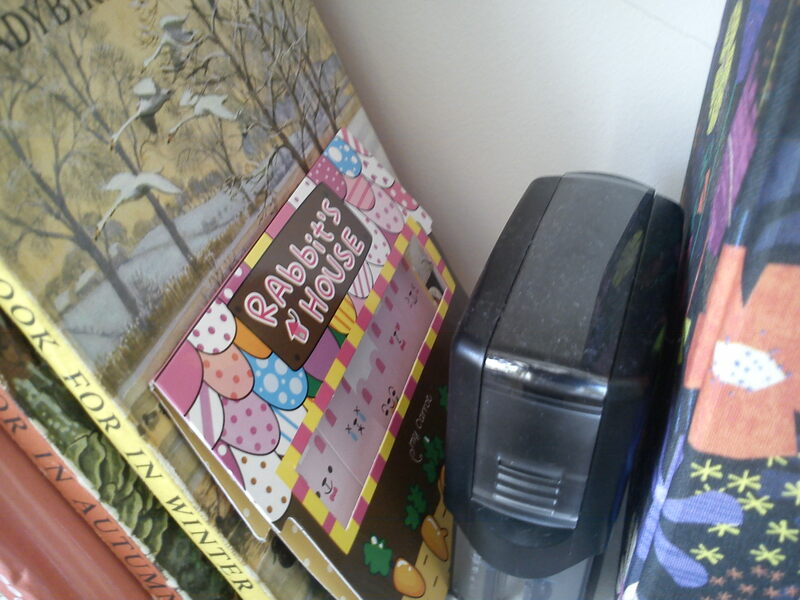 Lovely notebooks from Sukie, after you have filled all the pages why not cut off the cover and frame it? Cable and cotton lights are so pretty and you can choose whatever colour combination you like, its a bespoke service. Check out the online gallery for inspiration. twelve floors up is the art and adventures of the lovliest lady Chantelle Cheshire. 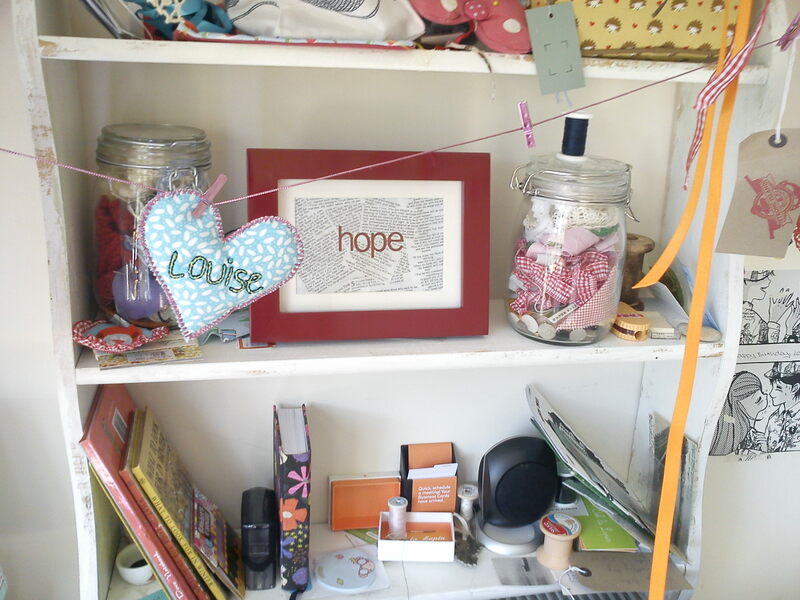 Her blog is a great guide to whats going on locally as well as a look at her work. 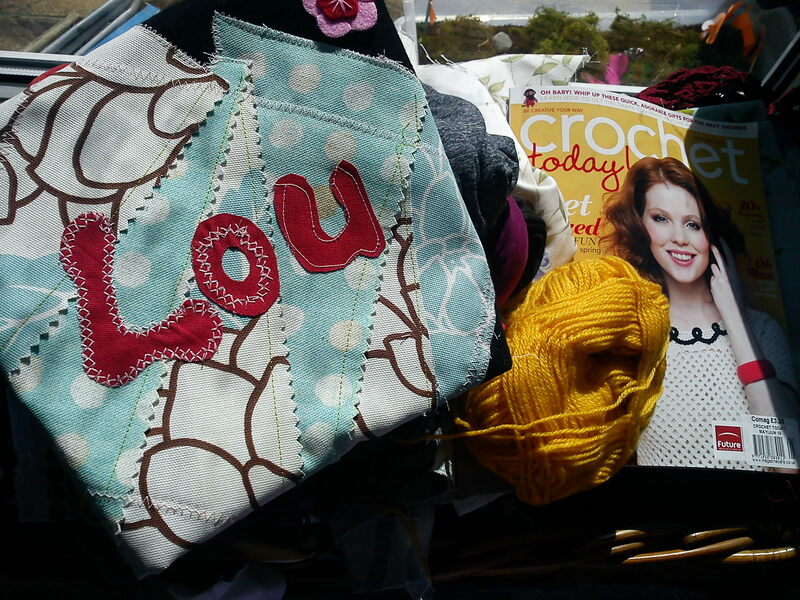 Tatty Bird is the blog of local artist and all round awesome stitcher/painter Emma Seymour Noble. If you havent bought a piece of her work yet you should cause she’s gonna be well famous. You can now read about all the adventures we have at work. 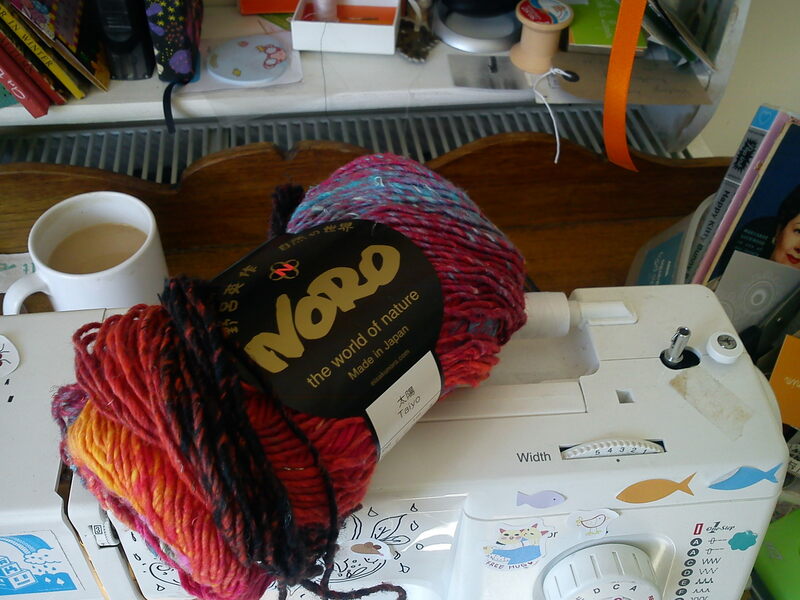 Getting involved in our knit-a-thon helps keep our projects going, so get invoved! Here is jpeg of the sponsorship form, just save it to your computer and print it out A4 siz. Ask family, friends and neighbours to support and lets raise some much needed cash for art outreach in Portsmouth! 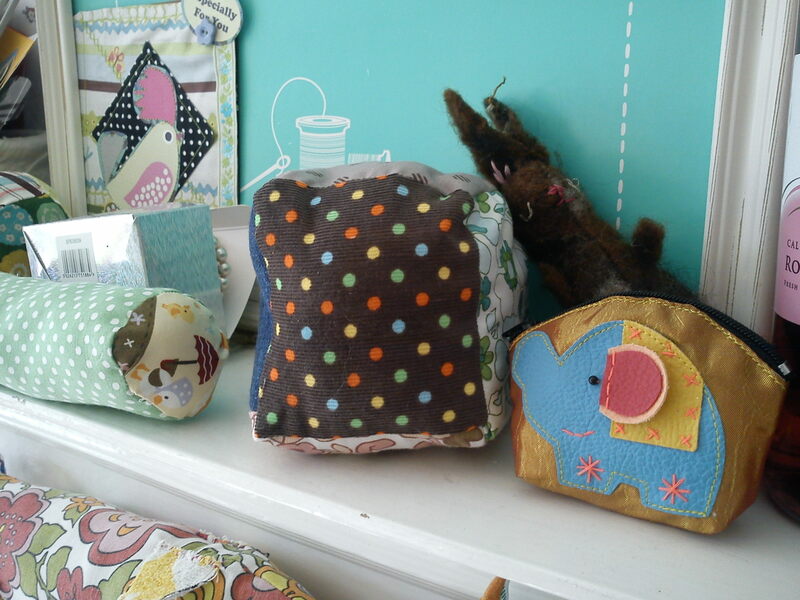 I am now selling patchwork fabric in my online store, ideal for lots of projects. Each pack contains beautiful vintage squares, japanese linens and florals. 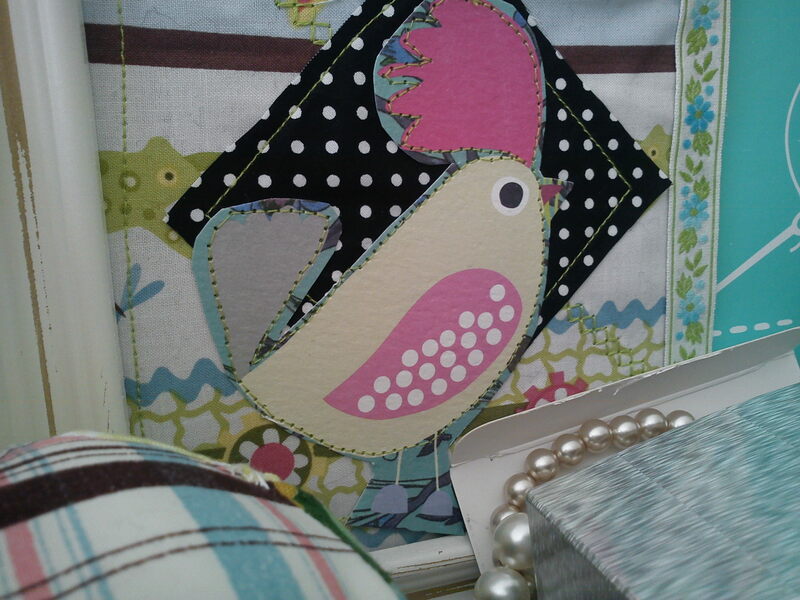 I will soon be selling fabric off the bolt so watch this space for lovely fabrics to order! well I had an amazing birthday party Monday night at Tea Tray in the Sky. Thank you Nicky and Heidi for my birthday cake. Thanks to all my dear dear friends and family for the fantastic presents. It was mix of handmade gifts (which people knew I would totally appreciate) kitsch Japanese inspired bits, floral undies, wine, Benefit make-up (nice) and plenty of hugs! 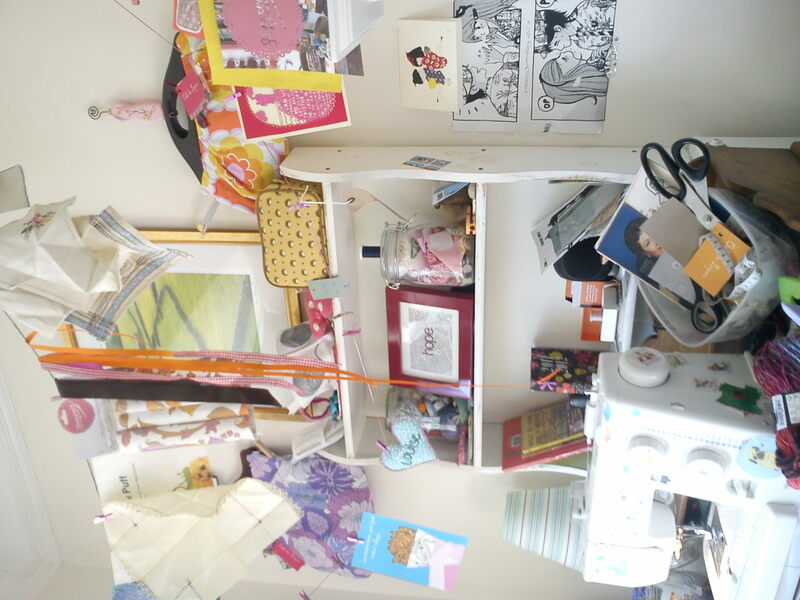 Here are some photos of my studio this morning housing pressies, see if you can spot yours! 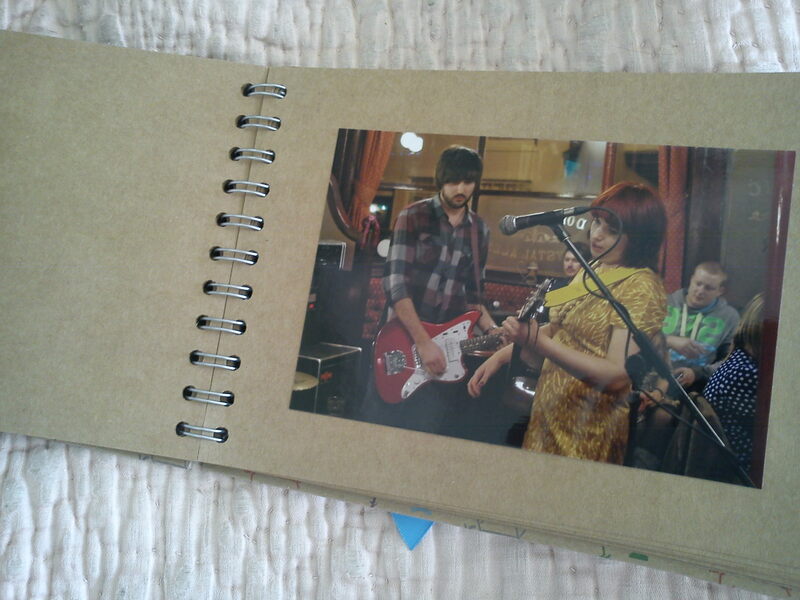 Helen I love the photo album you made for me, all pictures of me rocking with the band and sewing things. 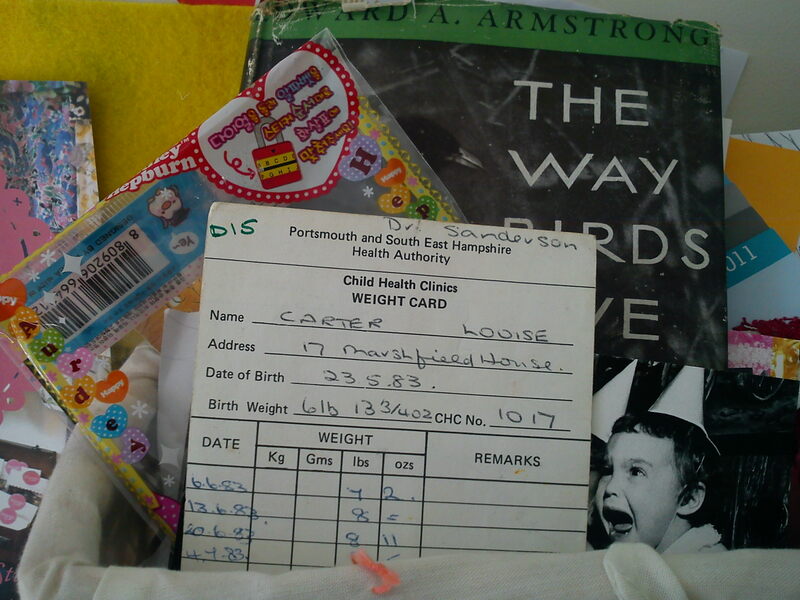 My Mum gave me my birth weight card, cute! my Mummy in law sent me 2 balls of super expensive Japanese yarn, dip dyed and made with silk! Thanks again to everyone who made my birthday really special, sorry if I have forgotton you, ooh and Emma the Flowers look pretty in my lounge. type in LOVELAPIN at the checkout to get a further20% off sale items! Its constantly bugging me how in interior design mags that I fritter my money away on they feature light spacious homes, even the so called ‘cosy cottage’ looks bloody huge when you live a Southsea terrace house! 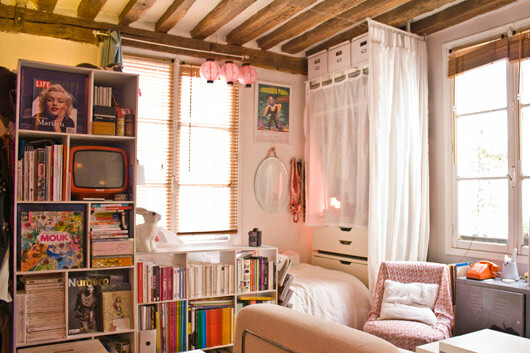 So today lets look at some inspiring smaller homes and flats, and small doesnt have to mean minimal decoration. 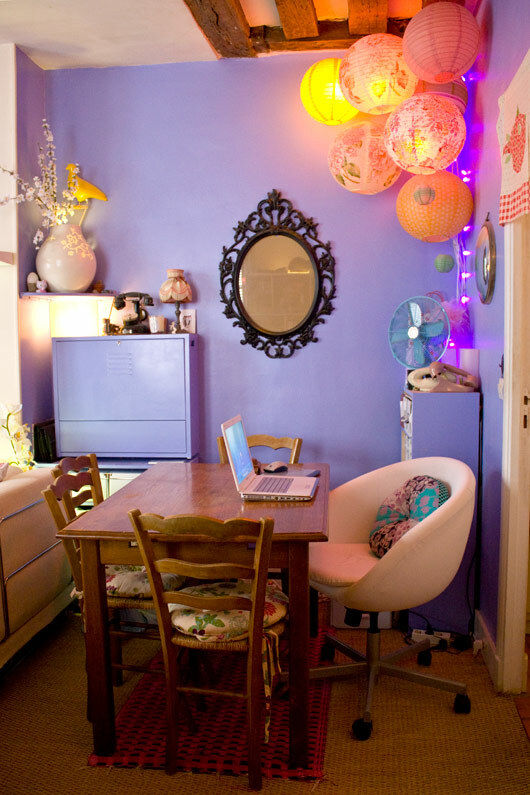 I love this Parisian apartment,its so homely. visit Eleanore Bridges blog for lots of photos. 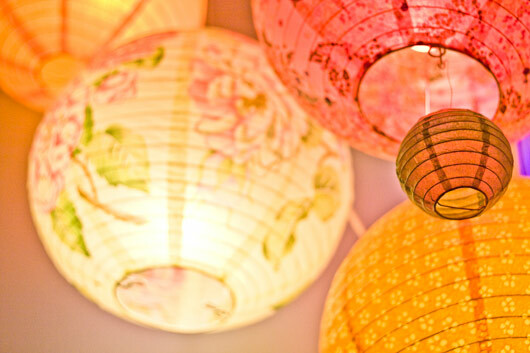 I love this grouping of paper lights, it looks warm and pretty. Benches are a good way of increasing space round a table. This Thursday 26th May Tea and Cloth will definatly be on! 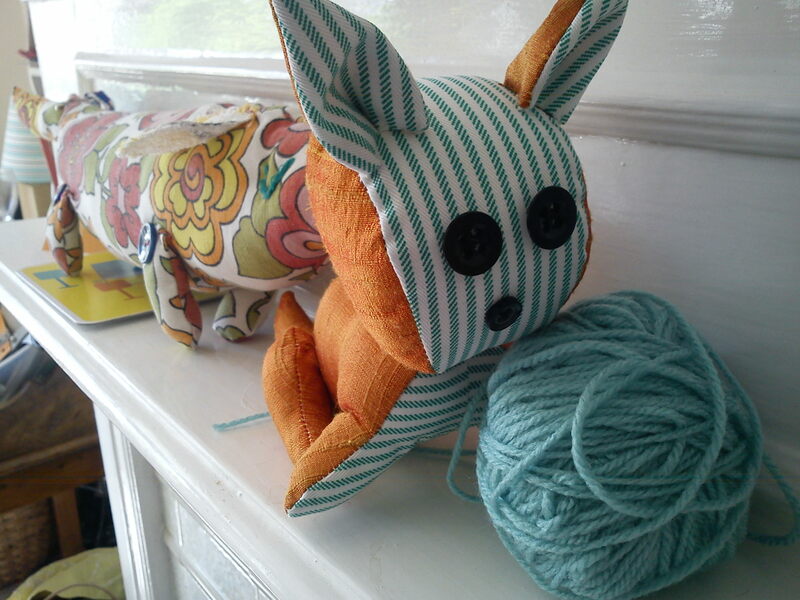 To make things even more super special we will be doing a free felt making demo, tres exciting. 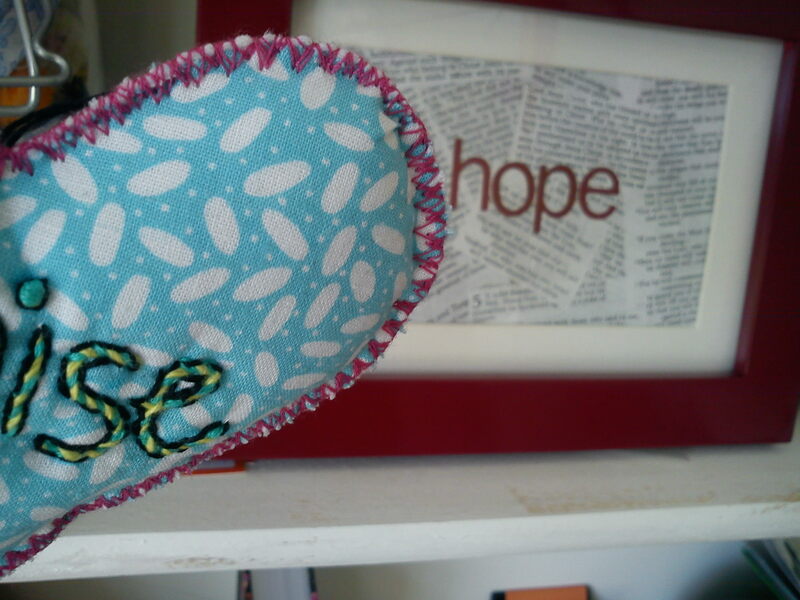 So you could make a beautiful cushion like the one below once you have mastered felting! 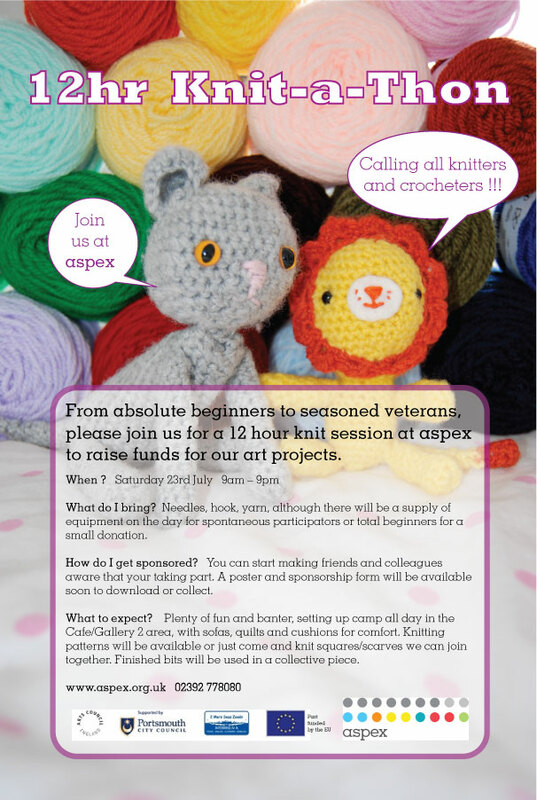 Felting is a really beautiful craft and very accessible, so this is a great opportunity to learn the basics for free!